St John’s is committed to providing opportunities for assistance with costs associated with living at the College. Various scholarships and bursaries, with a total value over $500,000, are awarded at the discretion of the College, to commencing and returning students. Scholarships and Bursaries range in amounts and are attributed to College fees. Scholarships are awarded to students who demonstrate high academic achievement or outstanding abilities. Bursaries are awarded to students primarily based on financial need, and are offered on the condition that other means of financial support have been explored and exhausted. You will be requested to upload the following documents. 2019 Scholarship applications and offers are considered in 2 rounds. Round 1 – open to Returning and Commencing Students. Applications close Friday 26 October. Applicants will be notified by 30 November 2018. Round 2 – open to Commencing Students only. Applications close Friday 11 January 2019. Applicants will be notified by 30 January 2019 . The following Scholarships, generously donated for the benefit of St John’s students, form part of the Scholarship program and may be applied for on the Scholarship Application form. The particular Scholarship or Bursary awarded is at the discretion of the College. Richard Bede Scholarship ($5,000) is offered within the Faculty of Law. It was founded in 1921 and bequeathed by Mrs Mary Anne Dalley in memory of her late husband. Collegiate Scholarship ($1,500) was established by the College Council in 2004. Chartwells Scholarship ($2,000) was donated by Chartwells. William John Dunne Scholarship ($6,000) is offered within the Faculty of Arts and Social Sciences and was endowed under the will of the Very Reverent William John Dunne. George Patrick Dwyer Scholarship ($4,500) assists a Roman Catholic student of merit who would not otherwise be able to reside at the College. It was established in 1929, bequeathed under the Will of George Patrick Dwyer. John and Margaret Ellwood Scholarship ($4,000) is offered within the Faculty of Music. It was founded in 1934 and bequeathed under the will of Eliza Ellwood in memory of her parents. Garry Memorial Scholarship ($3,500) is offered within the Faculty of Engineering and IT, awarded based on academic results. It was named for John Joseph Garry who studied engineering at the University of Sydney. Thomas Keenan Scholarship ($10,000) is offered within the Faculty of Science, Agriculture, Environment and Veterinary Science. It was founded in 1925 under the will of Francis Joseph Keenan. Matt Laffan Scholarship ($24,960) provides financial support to a physically disabled student. It was established in 2009 in memory of Matt Laffan, a former student in college 1989-93 who passed away in 2009 from complications related to his physical disability. John Thomas Lynch Scholarship ($6,000) is offered within the Faculty of Business and was endowed under the will of the Very Reverent John Thomas Lynch, Fellow of the College in 1861. F J McCarthy Scholarship ($5,000) is offered within the Faculty of Education and Social Work, to a commencing student. It was founded in 1918 from a bursary gifted by Miss McCarthy of Leinster Hall, Darlington, who died in 1918. Morgan Residential Scholarship ($6,000) is offered within the Faculty of Engineering and IT, awarded based on academic ability, financial need and collegiality. It was established by Dr Brian Morgan AO in memory of his late wife Mrs Jenny Morgan. O’Connell Scholarship ($5,000) is offered within the Faculty of Architecture and Interactive Design to a student following completion of their first year of tertiary study. It was founded in 1875 from funds subscribed during the centenary of the birth of Daniel O’Connell (1775-1847). Marc Playoust Scholarship ($2,000) is offered within the Faculty of Music and awarded to a student who will contribute to liturgical music in Chapel. It was founded in 1974 by family and friends in memory of Dr Marc Playoust, a Resident Tutor at the College from 1958-1969. Richards Scholarship ($7,000) is offered within the Faculty of Health, Medicine and Dentistry and awarded to a student who has been in residence at the College for at least one year. It was donated in 2007 by Dr John Graeme Richards, an alumnus of the College from 1944-49. Alexander Gunning Watson and Ellen Maud Watson Scholarship ($12,480) is offered within the Faculty of Health, Medicine and Dentistry, to a student of Medicine. It was bequeathed by Mr Watson under the will of Mrs Watson. To apply for the below scholarships, please click on the name link to the individual application forms. Pat & Frank Harvey Medical Scholarship ($17,250) is offered to a student undertaking the Doctor of Medicine program. The Scholarship may be held for up to 4 years while the student is enrolled in the MD program subject to satisfactory academic progression. Pat & Frank Harvey Indigenous Scholarship ($5,750) is offered to a an indigenous student studying for an undergraduate or postgraduate qualification. The Scholarship may be held for up to 4 years while the student remains enrolled in the qualification program for which the Scholarship was granted, subject to satisfactory academic progression. 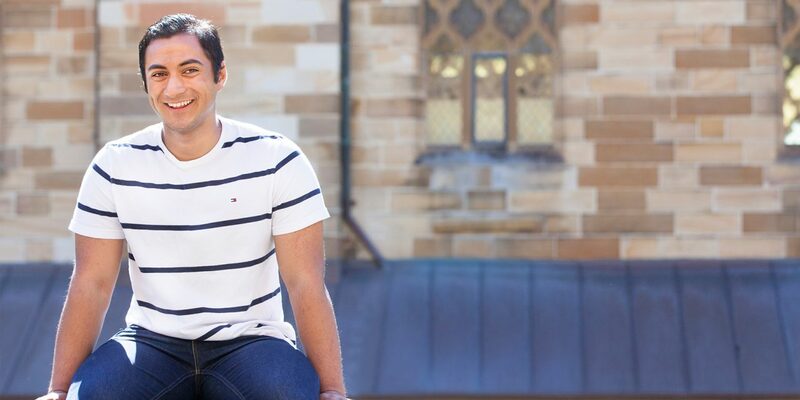 Sir Earle Page Memorial Trust Scholarship ($5,000) is offered to a student in their first year of an undergraduate qualification at the University of Sydney and resident at St John’s College, an Australian citizen, actively engaged in sporting pursuits, whose home address is outside the Sydney metropolitan area. Financial assistance applications are means tested and ranked against all other applicants. Financial assistance is not offered to students from households with a combined taxable income of over AUD $250,000, and we reserve the right to decline financial assistance where the College determines students have a reasonable ability to pay. Financial assistance is awarded as a credit against College fees each semester. What do I need to include when applying for financial assistance? Evidence of academic achievement including transcripts of academic results. When is the best time to apply for assistance? We recommend applying at the same time as you apply for a place at College. Some of the supporting documentation required for the financial assistance application is included in your application for a place at the College. Can I earn money at College? St John’s College offers approximately 20 employment positions to students, from the beginning of their second year at College.